Inordinate claims by Sai Baba of association with major world figures and his being behind momentous world events – all promoted by zealous followers – included some of his greatest boasts made in interviews (hence not officially approved, for obvious reasons) but which nevertheless were publicised on the world-wide web by zealous devotees and office-bearers. Baba was determined to transform the world into his predicted Golden Age he would. He used both the most subtle and most blatant deceptions to attain to the world superstardom as he had proclaimed around his mid-life. Despite his attention-grabbing orange robe with his afro-frizz, his claims of fantastic – indeed incredible – miracles beyond anything any previous deity had even attempted and despite his constant self-promotion, he ended up very far from being as known or revered by the world as the saviour of mankind or the deity of all deities he professed himself to be. Very notable too was the claim – made at an interview which was leaked to others by one of those present – that he helped Neil Armstrong first set foot on the moon (by pressing him on the shoulder at a crucial moment)! Some even claimed Armstrong had an interview with Sai Baba, but the propaganda machine has never confirmed this, which would be a huge scoop for them. Nonetheless the story is still circulated by people who have picked it up as hearsay. ￼Sai Baba spoke to Neil Armstrong about his journey to the Moon. 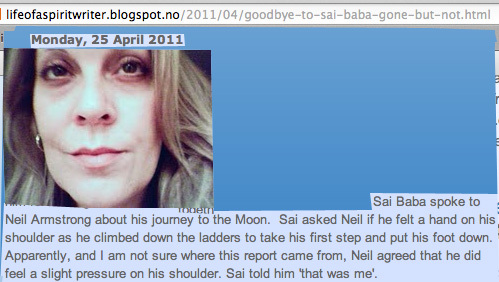 Sai asked Neil if he felt a hand on his shoulder as he climbed down the ladders to take his first step and put his foot down. Apparently, and I am not sure where this report came from, Neil agreed that he did feel a slight pressure on his shoulder. Sai told him ‘that was me’. Baba even pretended that he would give ‘darshan’ of his face on the moon, causing a great furore so that thousands flocked to see this in Puttaparthi, only to find the sky was overcast with clouds. Despite that, many claimed they saw him on the moon. Asked about Nelson Mandela in South Africa around the time of his release from prison, Sai Baba supposedly replied “Yes. I have a good man there”, according to a questioner in an interview. Mandela never once mentioned Sathya Sai Baba, as far as can be discovered. Another major boast by leading office-bearers was that Sai Baba has predicted the fall of the Berlin Wall. He was reported by some evangelising interviewee AFTER the wall fell as having said ‘Communist come-me-next‘ without further comment whatever. That utterance was repeatedly confirmed by his some of his officials as the omni-prescience of Sai Baba. One devotee from East Germany claimed that she knew (through some vague interpretation of a claimed ‘leela’) that Sai Baba had caused the wall to fall. Many devotees were of the opinion that it was even all his doing, not least since he claimed to be the Divine Director of everything that happens! Though reports on this claim were largely deleted later (for reasons one may well guess). His interpreter and very close follower, Professor Anil Kumar, confirmed this in an interview he gave to the Thailand media here where he stated that Sai Baba: “… said long ago that Muslim nations will go through turmoil and terrorism. We’ve seen that in Afghanistan and Iraq; he predicted the unification of Germany, and long, long ago he said the Soviet Union will collapse. Then, he also predicted the decline of the US economy and the dotcom bust.” The US economy declines and rises, like most economies. Since then it has had very considerable growth! Reports of this kind on Sai Baba false propaganda pages on the Internet were removed, almost certainly by order of his minions so as to limit any criticism and counter-proof that would surely emerge internationally. But some web sites did not conform with th wishes of the Prashanthi censos. For example, that President Obama was positive towards Sai Baba was still blazoned across the web by the independent propaganda site saibabaofindia.com. It claimed, without any evidence to show for it, that ‘someone’ gave Obama a photo of Sai Baba , which he gracefully accepted. If he did, it would be an unpresidental act reject something he probably knew nothing about on the spot in the glare of the limelight. Read more about this here. The Obamas never mentioned, let alone endorsed, Sathya Sai Baba and no condolence was sent by them or US government when Sai Baba died and was buried in 2011. Sai Baba enjoyed mixing among the powerful to the extent of associating with criminals like Idi Amin (see full documentation), (now former) Italian Prime Minister Bettino Craxi (convicted of 18 years in prison plus massive multi-million dollar fines and also the Mafia-involved Prime Minister Giulio Andreotti and not least many corrupt and criminal Indian figures. His followers, especially rich but otherwise unsuccessful and gullible persons, whom he selected as his favourites, tried to promote him through similar deceptions. Constant efforts were made to induct, by whatever indirect means possible, the Dalai Lama to his cause. The Dalai Lama could not possibly endorse anyone who claimed to be God Creator of the Universe, though he did send his formal condolence when Sai Baba died. A far more compassionate person than Sai Baba, it is also likely that, living on sufferance in India where the ruling powers covered-up entirely for Sai Baba, the Dalai Lama did not want to risk the wrath of the powers that allow Tibetans a refuge there. See discussion here. A minor London Indian news outlet (The Asian Voice) published a rebuttal of the BBC programme ‘The Secret Swami’, claiming among other things that “Some of his famous followers include John Lennon, actor Richard Gere and Bill Clinton. The ashram in Puttaparthi is said to be more visited than the Vatican in Rome, as millions flock to see, touch and be near Sai Baba.” (by journalist Payal Nair) Almost needless to say, John Lennon never even mentioned Sai Baba, though he had visited the ashram with Yoko Ono briefly (following George Harrison who was apparently enthused) and been ignored by him totally and left very soon in disgust. (The VIP lady, Indra Devi, who had been instructed to cosset him, addressed him in her ignorance as Mr. Lemon, which she tells in her hagiography about Sai Baba). Both Bill and Hilary Clinton have been claimed as visitors, but neither were, though Hilary was in South India and was expected by some to visit him on a break of a journey from Madras to Bangalore. No word about Sai Baba is found anywhere by either of the Clintons. As to the claim of Sai Baba having more millions of visitors than the Vatican got, this preposterous claim was based on the massive long-term programme of disinformation by Sai Baba and his unquestioning spin doctors. On a TV programme about Sai Baba (‘Divine Sin’) in Argentina, the International Chairman of the Sathya Sai World Organisation, Michael Goldstein read a letter in which Sri Atal Bihari Vajpayee, Prime Minister of India, manifested being hurt by “the wild, reckless and concocted accusations made by certain vested interests and people against Bhagavan Sri Sathya Sai Baba … [who] is revered globally as an embodiment of love and selfless service to humanity.” Goldstein refused to give copies of the letter to the press. “We are still waiting for it to be subscribed by dignitaries of the whole world,” he said. They were to get signatures from the President of El Salvador and Guatemala, as well as Al Gore, former vice-president of the United States. Goldstein also gave some news that left the sweating audience mute: On September 11, the devotees that worked at the Twin Towers and the Pentagon didn’t go to work that day or were late getting to their jobs. “Thanks to our beloved Bhagavan,” pontificated Goldstein, “all the New York and Washington devotees are safe.” Needless to say, the world never subscribed to this deluded talk, and Al Gore was too smart to connect himself in public to Sai Baba (it would have been the end of all his political aspirations, which he still nurtured at that time). “In the years that followed we made many returns to the feet of our Sadguru, Sai Baba. One of these returns took place a few days after Gorbachev had appeared on the stage in Russia and that country had begun the governmental change that brought an end to the Cold War. On the day of our arrival, Swami, knowing no doubt that I had a question to ask him, called me into the interview room but he called several other men with me. Somehow I did not feel it was right to ask him this great question in front of others. So mentally I asked him very definitely if he had brought about the change of government in Russia. A mental question is as good as a verbal one to Swami. His eyes gave me the affirmative answer but all his lips said was, “Gorbachev is a good man.” I knew then that he had played some wonderful, powerful tune on the akhasic strings that had manoeuvred circumstance and brought about the great change.” (ital. above are mine – see also http://www.saibabaofindia.com/howard_murphet_lights_of_home.html). The above instances are far from attempts to gain fame, fortune and influence in the world by Sai Baba and his adherents.